Bocconcino offers two dining sections. The downstairs section is notable for its chic-meets-modernism look. Twirls reminiscent of a oozing tiramisu base tower above you on the ceiling. Decadent and comfortable chairs on a super plush carpets facilitate the sense of sprezzatura you feel once you settle in. 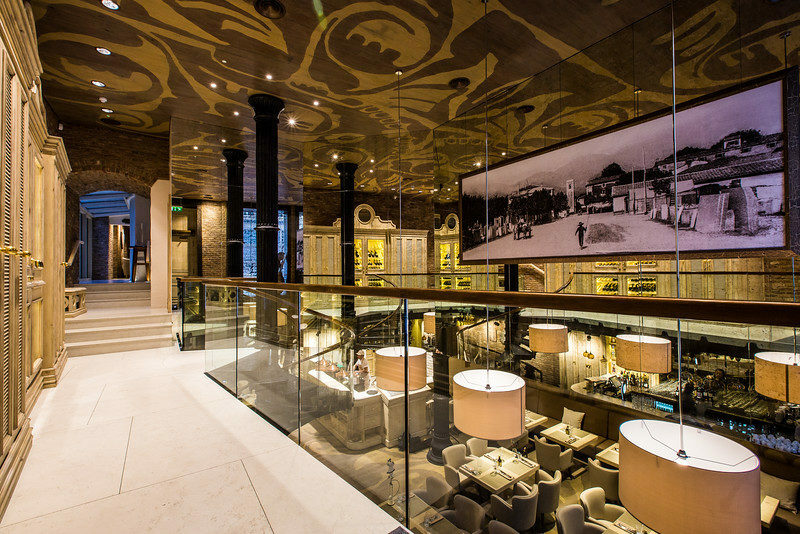 The atmosphere is charming: both flamboyant yet relaxed, it is an homage to some of the glory of Italian culture. The back dining section is a little more intimate: a darker room is presented, lit up as if by candlelight. The room doesn’t have the height that downstairs has and tables are a little closer together. One could be in a family restaurant in Italy here, if it were not for the ubiquitous British accents. 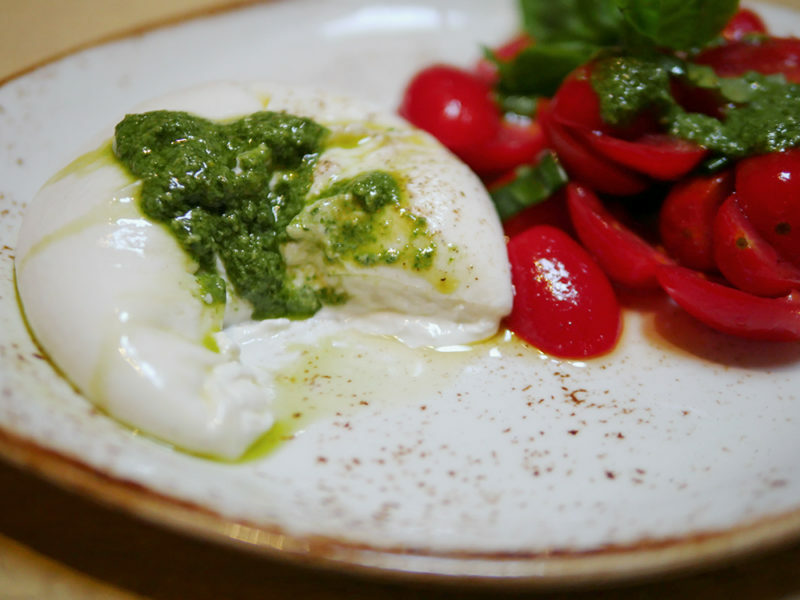 We started off with the Burratina D’Andria Con Pomodori E Pesto – a celebration of all that is delicious and moreish in Italy. The tomatoes were succulent and ever so slightly sweet – a mark of their quality. The burrata, too, was luscious and thick and one of the best we’ve had in London. For your perfect Bocconcino induction, look no further! This was followed by our primi piatti: Tagliatelle Al Tartufo Nero Estivo and Linguine Al Nero Di Seppia Con Gamberi Rossi. The tagliatelle was a celebration of all things truffle, with the perfect balance of truffle-infused oil and shavings to bring out a melt-in-your-mouth flavour. 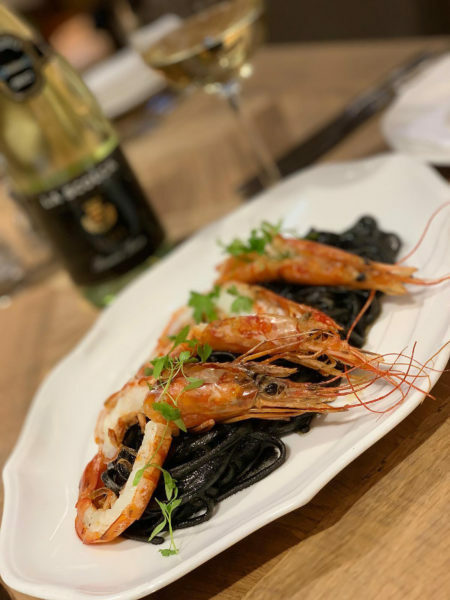 The black ink linguine, too, was perfected, with the prawns giving a healthy dose of taste al mare to this wonderfully delicate dish. Our mains consisted of the Filetto Di Tonno Con Peperoni Dolci E Olive Taggiasche and Sogliola Alla Mugnaia. The tuna was cooked to perfect, with a little pink showing in the middle. The olive taggiasche was the perfect delicate condiment for the dish. The sole fillet, too, was superb. Minimally dressed, allowing for a slight citrus and salt flavour to come through, the dish epitomises the saying ‘less is more’. Our finale was the Italian classic: Tiramisu. With a strong coffee flavour permeating every bite, this was a slightly savoury desert and an unusual welcome from the other versions we have tried. Other temptations include the signature Pizza Dolce that we vowed to try on our return. If unpretentious, fine dining Italian is your thing, then look no further than Bocconcino.